Powers/Abilities: Cuchulain possesses extra-ordinary stamina, speed, reflexes and resistance to harm above any other man. He is also an exceptional warrior with a sword and in unarmed combat. His preferred weapon was a spear called gae-bolg. 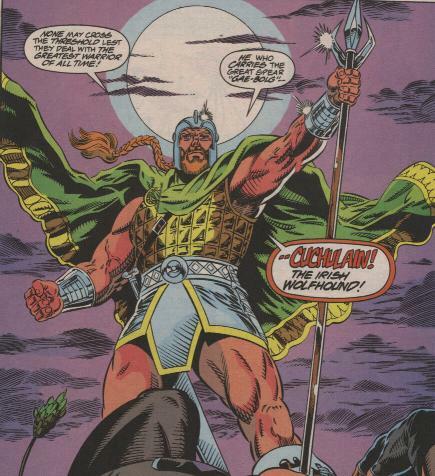 In the time of the Guardians, Cuchulain was massively powerful (Class 100 strength), able to survive sub-nuclear explosions and go one-on-one with Drax the Destroyer and come out on top. History: (Celtic Legend) - Cuchulain was born around 540 AD (see comments) to the sun-god Lugh and Deichtire, sister of King Conchobor of Ulster. She named him Sedanta and he proved himself to be of divine birth by defeating fifty youths in his uncle’s court. He earned the name of Cuchulain after slaying the watchdog that belonged to Culann the smith. As penance for its death, he had to take the place of the dog for twenty years and protect Culann from harm. Cuchulain eventually was released from his sentence in time to defend Eire against the three sons of Nechta Scene who were terrorizing the land. He killed them by cutting off their heads at once. He even hung the heads from his chariot as a trophy. Queen Mughain, another wife of King Conchorbor, tamed Cuchulain by treating him hospitably. He desired her daughter, Emer, to be his wife. Before he could prove to be worthy husband for her, he had to travel to Alba and serve as a student to the prophetess Scathach. He clashed against her rival, Aoife, a female warrior, and raped her to humiliate her. She eventually gave birth to his son Conla. Cuchulain also tried to capture mystical birds as gifts for Emer, but was punished by the Celtic Goddesses Fand and Li Ban for trying to harm them. Returning to Eire, Cuchulain and two other warriors, Loeghaire Buadhach and Conall Cernach were bribed to claim the honor of carving the roast of Bricriu, a minor hero with the malicious intent of turning them against each other. The heroes clashed as he had planned as they went to Queen Medhbha for best judgement on who was the best warrior. She chose Cuchulain, but the other two were sure he had bribed her so they went to King Roy of Munster for a second opinion. He also chose Cuchulain and they seemed to accept this judgment although their feud was left unsettled. King Roy then used mystical means to prove his choice. He sent a giant to challenge the three warriors. The giant fought Loeghaire and lost his head in the fight--literally. Reclaiming his head to reattach it, he returned the next night and claimed the right to claim Loeghaire’s head. Loeghaire asked Conall for help against the giant and he resevered the giant’s head from his body. Recollecting his head, the giant returned a second night claiming the right to take both their heads. Loeghaire and Conall fled to Cuchulain for help and all three of them killed the giant once more by cutting off his head. Reclaiming his head, the giant returned to claim all of their heads. As Cuchulain stepped forward to take his punishment, King Roy appeared and declared Cuchulain the true champion of Eire for being able to concede defeat. By now, Cuchulain’s son, Conla, had grown to manhood. He came to Eire to take his father’s place as the greatest champion of Eire. Defeating Conall in his search, he was recognized by Emer as Cuchulain’s son, but Conla had taken a vow from his mother to not reveal his identity to his father. Cuchulain clashed with Conla to exact revenge on the and delivered a fatal blow. Dying, Conla admitted to being Cuchulain’s son and his body was presented to the men of Ulster for a noble burial. Cuchulain later served King Roy by invading Caledonia (modern Scotland ) and returning with several treasures. When he refused to share his spoils of war with King Roy, the wily ruler sought to teach him a lesson by having him buried in the ground up to his head. His head shaved, Cuchulain swore revenge on his former ally by conquering Munster and taking his wife, Queen Blathnad, as his mistress. Fercherdne, the royal bard, avenged King Roy by slaying Blathnad for allowing herself to be taken so easily and for giving herself to Cuchulain. Cuchulain single-handedly protected Ulster from King Ailill and Queen Medhbha’s invading armies. Morrigan, Queen of the Celtic Gods, appeared in the battle in her form as the war-goddess and when Cuchulain refused to recognize her, she cursed him with madness. He tried to break the curse by eating the flesh of a dog which ended up weakening his godly endurance. Realizing he was about to die, he tied himself standing to a pillar in order to die in battle standing up. Killed by Medhbha’s soldiers, Cuchulain was beheaded by his enemies. (Guardians of the Galaxy#51 (fb) - BTS) - Cuchulain was an ally (and possibly a member) of the Red Branch Knights, to whom he was a hero (see comments). (Guardians of the Galaxy#51 (fb) - BTS) - Cuchulain fought the Scots Giant, Finn Mac Cool (see comments). (Guardians of the Galaxy#51 (fb) - BTS) - (see comments). (Guardians of the Galaxy Annual#3) - <2001, Earth-Guardians timeline> A century after their first assault, the Martian Masters again attacked Earth. Many of the Earth’s modern heroes died in the invasion as the heroine Shamrock fled to protect modern Ireland. Doctor Druid, however, saw a need for the Earth to be restored years after the end of the invasions. He presented her with the Book of Kells, a mystical book detailing Ireland's history. He learned that Cuchulain’s spirit was one of many protecting her and restored him to life to protect her through infinity. In the 31st Century, there became a need to reverse a growing illiteracy problem and the Guardians of the Galaxy sought out the Book of Kells and traced it to a forgotten Celtic tomb near Newgrange, Ireland. They encountered Shamrock and Cuchulain and helped them to defeat Samhain, an ancient demon who sought to destroy the book. Aided by the Guardians, Cuchulain and Shamrock defeated Samhain before departing to investigate the 31st Century and restore Ireland. (Guardians of the Galaxy#51) - The Guardians of the Galaxy came to Earth to recruit Cuchulain's aid in freeing their member Charlie-27 from the prison-planetoid, the Stockade, in which he had been placed for false charges of being the interstellar murderer Ripjak. Initially attacking Major Victory (whose appearance had changed dramatically due to bonding with a Venom-like symbiote, I think), Cuchulain released his stranglehold on Vance upon recognizing the others. Cuchulain agreed to join them and returned with them to their starship. Not long after, the Guardian Talon manipulated the techno-ignorant Cuchulain into activating the Trans-Molecular Reconstitutor, which cured his secret back injury and transformed him into a much more savage form. (Guardians of the Galaxy#52) - Arriving in orbit around the Stockade, Major Victory led Cuchulain to the Stockade, where the chief constable presented documentation of Charlie-27's guilt. Not liking this, Cuchulain threatened the small constable, attracting the attention of the large Jadroxxian Gladiators that served as guards at the Stockade. More than happy to engage in a wee donnybrook, Cuchulain battered the guards into submission, prompting the constable to call a Double D alert--standing for Drax the Destroyer. A guard deactivated Drax's cartoon show and told him that Cuchulain had cut them off, and that Cuchulain was trying to make it so that he could never watch TV again. Drax was less than pleased. (Guardians of the Galaxy#53) - The furious Drax assaulted Cuchulain, furious at him for cutting off his cartoons. Pleased to have finally found someone able to give him an even fight, Cuchulain fought back, and the two shattered walls, ceilings, floors, and anything else in their path. Drax eventually managed to get Cuchulain in a neck-breaking hold, but the Wolfhound managed to shatter a nuclear containment chamber, causing an explosion that buried them both. Cuchulain was the first to revive, and he lifted off the debris and returned to the Icarus. Afterwards, the Guardians sent Cuchulain on an auto-shuttle which returned him to Earth, but not before Yellowjacket gave him a friendly "super-send-off." Comments: Adapted by Michael Gallagher and Collen Doran. Note: Cuchulain has not yet been seen in the modern era, and the version seen represents a being from an alternate future timeline. Whether Cuchulain is alive and/or active in the modern era of Earth-616 remains unknown. Still, the Celtic Legend would remain the same or similar, though the actual events as they may have occurred may differ. The Earth-616 Cuchulain's history was given in Druid#2. "Mighty Cuchulain, warrior hero of ancient Ulster, saw the washer at the ford squeezing blood from his corslet....and within hours, Lewey, king of Munster, hurled a spear that pierced Cuchulain's corslet and threw his bowels upon the ground". Chronologically, the Red Branch Knights/Red Branch Armies/Craobh Ruadhu are mentioned just before Cuchulainn goes to capture the birds for his wife. Since the story describes him as their guest in their fortress while he played fidchell (a wooden board game), I'd say they were his allies. Finn Mac Cool (real name: Fionn Mac Cumhail) was also named Fingal. He was an Irish Chieftain who became leader of the Fianna. They maybe ancestors of the Scots because "Fingal" is the name of the Irish tribes who went with him to Caledonia (modern Scotland) to defend it against the Norse. He existed around 511-550 AD and Cuchulainn lived in the reign of King Conchobor around 540 AD. Neither name is mentioned in the histories of the other hero so this would have to be incident only in the MU. Now, Finn owned a shield that belonged to Lugh, Cuchulainn's father, so maybe in the MU, he decided to go after it in the MU by realizing he had a greater right to own it. Conchobar, (Cuchulain's king) is supposed to have lived near the time of Christ as is Cuchulain himself. Indeed, there a number of old tales that center around Conchobar's reaction to the death of Christ, with him vowing to revenge his death after hearing of it from his chief druid. Cuchulain belongs more properly to the epic traditions of an earlier age (like Gilgamesh or the Oddysey) and Finn more to the world of fairly tales and a somewhat later era. The Ard-Ri (High King) in Finn's time is commonly agreed to have been Cormac. I hope no-one takes this as me pedantic at all as your site provides me with a great deal of amusement. In fact, the only other comic-book site which provided me with equal amusement was the late and lamented Unca Cheek's website, which you may be familar with. Thanks for the input, however, when it comes to estimating dates in either Celtic or Greek mythology, there are two ways to do it. You take an event like a dated event like the Trojan War (1193-1183), the sinking of historical Atlantis/Thera (c. 1490 BC, not to be confused with the Pre-Hyborian Atlantis which sank around 18,000 BC) or the founding of Rome and then estimate according to life spans, other events and archaeological info. When it comes to CuChulainn, theoretical estimations from the time of the Biblical flood (when Cessair, great grand-daughter of Noah, who landed in Eire) through the genealogical family tree to his life does place him within the time of Christ, however, if you take the list of Kings of Eire, his life occurs close to the lifetime of King Arthur. Why did I choose the latter, you ask ? One, I did not know the story of Cuchulainn vowing to avenge Christ, but then the early Christians who were placing these oral tales to paper for the first time were also altering them to fit their beliefs. Two, at the time of Christ, King Matholwych was Ruler of Eire, a land not yet divided up by rulers controlling counties as in the 6th Century AD when rulers as Conchobor and Ailill were often sending warriors against each other. In reference to fighting with one arm lashed down: My book describes word for word "CuChulainn single-handedly protected Ulster from King Ailill and Queen Medhbha's invading armies." I think this is what it may be referring to so the deceptive wording is my source's error than mine, but this would have to be the incident. Cuchulain's death was prophesized by the Beannighe, aka the Washer Woman at the Ford, a woman of Scottish/Celtic legend, who can be seen washing the coat of someone who will die. This mentioned in X-Men: True Friends#1 (or Druid#2, I forget which and I don't feel like checking). In the myth, Lugh seduced Deichtire by turning himself into a butterfly and entering her drink at her wedding to Sualtam to be swallowed by her. Sort of beats visiting her as a shower of gold or as a swan like Zeus did. 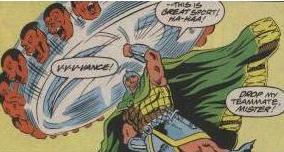 --no definite counterpart of Lugh/Lug exists in the Marvel Universe, though Will speculates that he may be Caber. In this version of Cuchulain’s history, the story of his battle with his son is placed after his ordeal with the giant because Conall Cernach is still alive then. Aoife, the rival of Scathach, is not to be confused with Aoife, the daughter of Bodb who is married to the sea-god Leir. --In the Marvel Universe, Leir is a Lightning God. It’s been claimed that the Scathach that trained Cuchulain and gave him his sword may actually by the same Scathach who predates back to the Hyborian Age. If she is, she’s one of the few Hyborian figures to have existed beyond that time. Along with Crom, Morrigan, Macha, Nemain, Lir, and others, of course! Cuchulain's height and weight come from the trading card included in Guardians of the Galaxy Annual#3. Michael Gallagher discussed his adaptation of Cuchulain in this article. Similarly, other characters in Earth-Guardians should be distinguished from their Earth-616 counterparts, EXCEPT Yellowjacket (Rita DeMara), who traveled forward in time from Earth-616 to join them for a time.